Phototherapeutic keratectomy (PTK) is a surgical tool that has been used for more than two decades to treat superficial corneal disease, irregularities and opacities. It can be an excellent alternative for patients who have undergone traditional medical therapy and continue to be symptomatic. or improved vision that has been decreased by scarring or corneal dystrophies. PTK involves removal of the corneal epithelium by alcohol or mechanical debridement. The excimer laser is then applied within a pre-planned ablation zone. Corneal irregularities, such as divots from granular dystrophy, can benefit from a process called fluid masking. With masking, the epithelium is removed and fluid is placed on the underlying cornea where it settles into the valleys of irregularities. The laser is then applied to a broad treatment zone where peaks of tissue exposed above the fluid are ablated. 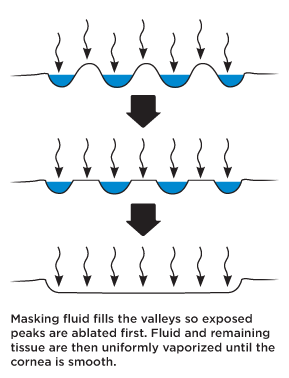 Once the peaks are reduced to the level of the fluid, both fluid and tissue are uniformly vaporized. Treatment is continued until the masking fluid is gone and the underlying cornea is smooth. RCE occurs because of an abnormality in the corneal basement membrane that can be due to penetrating injury or corneal disease. Patients experience recurrent episodes of pain, photophobia, foreign body sensation and decreased visual acuity. After trying several treatments (including copious lubrication, hyperosmotics, punctual occlusion, bandage contact lenses, doxycycline, epithelial debridement, anterior stromal puncture and basement membrane polishing with a diamond dust burr) some patients continue to have recurrent corneal erosions. It is this group that is most likely to benefit from PTK. EBMD or map-dot fingerprint dystrophy is an anterior corneal dystrophy that can cause pain and sometimes a significant decrease in visual acuity. Signs include microcystic edema and recurrent corneal erosion. PTK would serve the purpose of treating and preventing recurrent corneal erosion as well as eliminating disrupted corneal tissue that is causing a decrease in visual acuity. If patients with EBMD are asymptomatic, observation is the best management. But when progressive keratopathy develops that fails medical therapy, surgical intervention is indicated. Both types can result in recurrent corneal erosion and decreased vision from stromal opacities that tend to coalesce with time. Lattice dystrophy is the most common stromal dystrophy. It appears as a network of branching lines resembling the crisscrossing patterns of lattice. Patients can experience painful corneal erosions, decreased visual acuity, and abnormal sensitivity to light. PTK can reduce corneal irregularity and provide relief of symptoms caused by epithelial erosion, corneal haze and light scattering. Salzmann nodular degeneration is typically asymptomatic, although in later stages recurrent corneal erosions can ensue. Often presenting with nodules in the mid-periphery and periphery of the cornea, advanced cases can result in pain and diffuse inflammation. PTK works to rid the cornea of irregularities and decrease symptoms. Corneal scarring that affects vision is often a good indication for PTK. This can be the result of injury, an old ulcer or refractive surgery. However, scarring caused by infectious disease, particularly herpes simplex, is a contraindication to both PTK and laser vision correction. To improve visual acuity, PTK is ideal for treating scars located within 10-20% of the superficial and otherwise healthy cornea. PTK is an excimer laser surgery that can help relieve symptoms of pain and/or decreased vision from recurrent corneal erosion, corneal dystrophies and scarring. Patients who have undergone traditional medical therapy but continue to be symptomatic with anterior corneal pathology may benefit from this procedure and improve their quality of life. 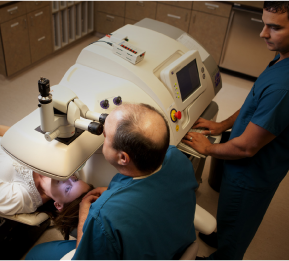 We provide PTK at most of our offices where laser vision correction is available. If you have questions about potential candidates for treatment, please contact any of our optometric physicians. Zuckerman SJ, et. al. “Analysis of the efficacy and safety of excimer laser PTK in the treatment of corneal disease.” Cornea 1996 Jan; 15(1):9-14. Ayres BD, CJ Rapuano. “Excimer laser phototherapeutic keratectomy.” The Ocular Surface 2006 Oct; 4(4):196-206. Rapuano CJ. “Excimer laser phototherapeutic keratectomy: long-term results and practical considerations.” Cornea 1997 Mar; 16(2):151-7. Stewart OG, et. al. “Visual and symptomatic outcome of excimer phototherapeutic keratectomy (PTK) for corneal dystrophies.” Eye (London) 2002 Mar; 16(2):126-31. Reeves SW, et. al. “Recurrent Corneal Erosion Syndrome: A study of 364 Episodes.” Ophthalmic Surgery, Lasers and Imaging 2010 Mar 9:1-2. Maini R., MS Loughnan. “Phototherapeutic keratectomy re-treatment for recurrent corneal erosion syndrome.” British Journal of Ophthalmology 2002 Mar; 86(3):270-272. Szentmary N., et. al. “Impact of phototherapeurtic keratectomy on the outcome of subsequent penetrating keratoplasty in patients with stromal corneal dystrophies.” American Journal of Ophthalmology 2004 Feb; 137(2):301-7. Rogers Christopher, et. al. “Phototherapeutic keratectomy for Reis-Bucklers’ corneal dystrophy.” Australia and New Zealand Journal of Opthalmology 1993 21(4):247-250. Lin PY, et. al. “Combined phototherapeutic keratectomy and therapeutic contact lens for recurrent erosions in bullous keratopathy.” British Journal of Ophthalmology 2001 Aug; 85(8):908-11.